As our pets age, the tissues lining the bones and joints may deteriorate and degenerate. Degenerative Joint Disease (DJD) describes chronic arthritis or osteoarthritis which is a gradual deterioration of articular cartilage within the joints. Joints consist of a tough fibrous joint capsule joining the bones. The joint capsule is lined by a thin membrane which produces joint fluid. This fluid acts as a lubricant and also carries nourishment to the spongy articular cartilage which covers the ends of the bones. The articular cartilage does not have any blood supply of its own to provide nourishment and oxygen. The articular cartilage receives nourishment from small vessels in the underlying bone and through absorption from the joint fluid. DJD can follow a number of joint diseases including infection and may follow surgery. It also occurs from excessive weight and obesity. This smooth resilient cartilage degenerates and becomes brittle and may actually split from the bone and become detached within the joint. Although DJD is said to be non-inflammatory, mild inflammation plays a part in causing clinical signs. The damaged cells of the cartilage release substances which result in inflammation, pain and further damage to the cartilage. Thus, once DJD begins it can become a vicious cycle. Can the condition be cured? Most of the damage caused by DJD is irreversible. Fortunately, new products are available that can slow the progress of the disease and promote cartilage healing. In addition, modern analgesics can effectively control pain without few side effects. Many dogs suffering from DJD are overweight. It is imperative that your pet’s weight should be monitored and reduced if necessary. If you have any difficulties or need help, please contact your veterinarian. There are many weight reducing diets available that work very well. Many of the early analgesics caused gastrointestinal upset. Recent advances mean that modern arthritis medications have few of these side effects. 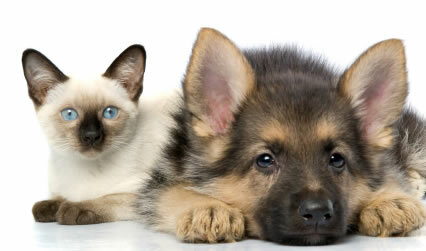 If you think your pet’s medication is causing side effects, please discontinue its use and contact your veterinarian. There are certain products that are described as nutritional supplements rather than pharmaceuticals, (i.e. drugs). These products have been termed nutraceuticals. These compounds often contain glucosamine (a glycosaminoglycan) and chrondroitin sulfate, along with other trace elements and vitamins. There are anecdotal case histories that suggest these products are beneficial, and it has been shown that they cause no side effects. If you have any questions or concerns regarding treatment, please do not hesitate to contact your veterinarian.